TraderFeed: Who Is Your Trading Coach? It's difficult to find a performance field, whether it's Olympic sports or performing arts, where people don't grow through coaching. 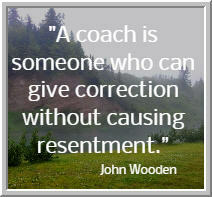 Coaches guide development; they provide the feedback that enables performers to set and achieve the right goals. If we always viewed ourselves accurately and were always 100% accountable to ourselves, perhaps we wouldn't need coaches. Very often, however, coaches see what we don't see and push us to be more than we are comfortable with now. If you check out my recent Bloomberg interview with the Odd Lots team of Joe and Tracy, you'll see that they compare my role as a trading coach to that of Wendy Rhoades, the fictional coach of the hedge fund portrayed in the show Billions. There is overlap, but--as I point out in the interview--there are important differences as well. Unlike counselors or therapists, coaches don't just help solve people's problems. They also build on strengths. They might help a team with conflicts among members, but even more often they're helping teams become more creative and generate more and better ideas. One thing I love about Alcoholics Anonymous is that there is no coach running the meetings, but everyone is a coach--and a student. In A.A., coach is a verb, not a noun. It is what people do with one another. Part of working on yourself is helping others. In seeing others succeed, we acquire insights and tools for our own success. In observing the challenges of others, we gain awareness of our own challenges. Back when I was a community psychologist in Cortland, NY, we used to challenge clients with alcohol problems to attend 90 meetings in 90 days. Bring the body and the mind will come. Over the course of 90 meetings, the group becomes your team and you find many coaches. Most specially, you find that you can coach others. With the consistency of 90 meetings in 90 days, the coaching lessons are internalized and become new, positive habit patterns. You don't want to backslide, because you have a responsibility to your team, not just to yourself. I'm not sure change can be optimally achieved without coaching. But I'm also not sure that one needs a single, dedicated trading coach. Imagine creating your own "Traders Anonymous", where a group meets regularly, shares challenges and successes, and supports each other's development. Would we fall into the same patterns if we had a group around us who gave us correction without arousing resentment? Might we advance further if we pooled our efforts and observations and stimulated each other's thinking? Who is your trading coach? It could be someone in your personal or online network. Once you think of coach in verb terms and not as a noun, then coaching is something you can do and others can do with you. It is no accident that I am seeing groups of traders coalesce with mentors, meeting frequently online, and learning about trading and trading mistakes. There is power in teamwork--power that few traders are maximizing. To get better, FIND. YOUR. TEAM.